Helping individuals and organizations to improve results and reach new levels of performance. What Are SAM Programs, and How Can They Help My Business? As a business owner, it’s important to utilize the different types of programs and tools that are available to increase the success of your business. Much like our full roster of leadership and consultation services, there are many resources to get your business up and running. More people are beginning to understand the benefits of software asset management (SAM) programs, which are designed to maximize savings and reclaim your budget. If you’re looking to improve your business, there are a few reasons to consider SAM programs. You can reduce your vulnerability with the use of SAM programs by controlling what is deployed on your network. The program will be configured correctly to ensure that you can avoid network breaches, viruses or conflicts in the future. You can become more empowered and competitive in the industry by utilizing programs that allow you to acquire the most advanced technology to increase your productivity each quarter and meet specific goals as you learn how to implement SAM programs. You can immediately have access to the latest products to ensure that you’re equipped to succeed and attract more customers or clients. As a business owner or manager, you’ll be able to spend less time and money investing in the maintenance, in-house configuration and testing that is often commonplace in most corporate settings. You can have more accuracy with your software costs by utilizing a SAM program to ensure that your licensing aligns with your goals for the business. You can have peace of mind knowing that you’ll get the chance to give more attention to your business strategy rather than spending more time than necessary on technology operations. As argued by PCM Canada, SAM programs ensure that “your organization will benefit from having the ideal number of software deployments.” By getting your software streamlined, you’ll never lose sight of your budget demands or overspend on new or unnecessary licenses. SAM programs can be worth the investment because they allow you to save more money throughout the year, cutting up to 30 percent of the money that you spend on software. You can spend less by reducing the cost of maintenance and reharvesting licenses for your business. One of the main concerns for many business owners is obtaining licensing that is the right fit. Fortunately, SAM programs are designed to provide you with suitable licensing that is aligned with your entitlements and compliance needs. SAM programs have many advantages when you’re looking to save time and money each quarter. Knowing how you can benefit from them can make the programs worth the investment. You can ensure that you’ll continue to succeed and remain on top of the game in your industry. Planning up front reduces waste of scarce resources and provides you with a clear path to follow to realize your dreams. 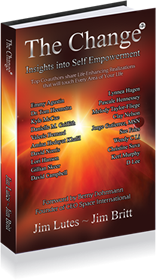 The Change explores powerful, thought-provoking insights from twenty inspiring co-authors. Prepare to be taken on a journey of self-discovery and personal change that will touch every area of your life!